I love everything about Simple Stories…from the colors and stylish design, to the fast and easy approach to scrapbooking. With all the precious elements we get in the kits we can create gorgeous layouts in a snap! Simple Stories is "The easy, fast and stress-free way to create gorgeous, one of a kind projects!" This is the best thing to happen to scrapbooking in years. I can scrap the way I want to every time. If I'm in a hurry, I can put together simple pages that look like they took all night! If I've got more time, I can embellish complex layouts till the cows come home. Bravo! I love your kits, they are so complete…there's nothing missing! You guys thought of everything! Simple Stories has it going on! The design, colors, ease, charm... LOVE it all! What an awesome solution! Thank you for combining my love for documenting memories and using my creativity without the guilt. xo! I really love the Simple Stories concept - it is just brilliant! It gives me endless possibilities…just like my imagination. I can bring to life whatever scrapping idea I have - in a simple and easy way! Did I mention I just love it? The perfect solution to feeling overwhelmed with pictures and scrapbooking! As it states it's SIMPLE. Amber and Kevin you are totally amazing. Fabulous, fantastic....I can't say enough! I love the Simple Stories system. It's so simple but can really be dressed up too. Perfect idea!! I love that the elements are trendy and look like you have spent lots of time creating, but it is designed for the busy woman who wants to preserve precious family memories. The best of both worlds! Love the concept and idea! This is a great way to get it documented and scrapped- something I have been lagging behind with in my family's life. I love the concept of Simple Stories and how you can create a quick 10 minute page or go all out on a series of pages or an entire album! This is a fabulous idea and I can't wait to get started! Love scrapbooking but it can take so long...now it doesn't have to. Thanks for coming up with this brilliant idea! I love the versatility and elegance of Simple Stories. It makes it so easy to scrapbook my photos. I really hope to see more great kits in the future. I've been overwhelmed by the amount of scrapbooking "stuff" available and not having the time to even think about it lately. Anything that can simplify the process is a winner for me! This is the perfect kit to take to a crop nite! It doesn't take hours to plan and pack, just grab and go! I got several pages done at my last crop event thanks to Simple Stories kit. Can't wait to see more! I have so many friends that are afraid to start scrapbooking because they feel overwhelmed by the work and the cost. This is the PERFECT option to get them started. Thanks Amber and Kevin. You guys truly rock!! What I love about Simple Stories is that it includes everything you need to finish an album quickly. There are times I don't have the time to go through all my supplies to put an album kit together and this makes it so easy. Great products too! I love Simple Stories! The colors, styles and the fact that they are double sided. Being double sided eliminates the need to choose which side to use because you can use both at the same time! Awesome work, MW! What attracts me to the kit is one of the more fundamental features and that is the pages of assorted sized pockets. I love that idea. It provides room for photos and the cards included in the kit but you can also use the pockets for ephemera. Great idea! I have really loved the freedom Simple Stories gives. The system gives a great starting point to help get me motivated and moving but I still have the freedom to create a unique and fun album. Amazing feeling to actually stay caught up. I love the different page protector formats with various pocket sizes for putting in a variety of photos and the pre-designed elements easily. I haven't scrapped in years, because I got overwhelmed with how long it took to do a simple 2-page layout now I have YEARS of photos that need to get into albums. I need this system! I went to a crop weekend this past weekend and played with my Simple Stories kit for the first time and I am definitely in LOVE, LOVE, LOVE!!! I got through half of my 2009 pictures in jsut a couple hours and they looked so fabulous! I am completely sold and can't wait to see the next edition of Simple Stories! Thank you so much! I absolutely love the STYLE of the Simple Stories kits…especially the vintage, distressed look incorporating a wide range of colors that don't overwhelm the photos! All the stickers and elements are so versatile; they can be used for any occasion. I've documented a wedding, kid's birthdays, holidays, office parties, local news and events, a walk in the neighborhood, trips - big happenings and day-to-day life can be incorporated and it all has a cohesive feel because the Simple Stories kits ties it all together as an album. And it goes together so quickly. It's such a rewarding feeling to COMPLETE so many pages in such a short time. Wow so amazing!! Simple Stories is something I suggest to all my beginning scrapbooking friends. You know, the ones that have a ton of baby pictures and their kids are in school now and they feel the guilt of not being "caught up." I tell them they can be in a few short weekends!! The flexibility of the system is amazing - you can do as little or as much as you want and you still have a gorgeous result at the end of it. 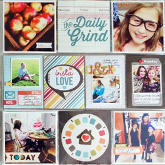 Because you can just slip in photos and create a quick cute title block this is the perfect system for a beginner - that 12x12 page is usually so daunting and they can scrap several pictures on one page or layout allowing them to see instant progress. For for/hassle for me and I just add my photos. You will make me feel talented and that is a great feeling. Okay. So I am NOT the talented scrapbooking type that so many of you are today! I didn't get that gene -- it all went to my sister! But I still like to scrapbook and capture my family's memories. And I am always looking for products that make that easier for the non-scrapbooking crowd. This one is a true winner in that regard! My neighbor and I have committed to using your kit to document 2010 together ... a month at a time. It will be our first books! With any luck, we'll develop some scrapbooking skills along the way and will be back for another kit for 2011! Thanks for making a product that makes all of us feel like we can scrapbook like the pros! I researched the best photo/scrapping option till I was blue in the face! I have 6 month old twins so it had to be simple and yet nice enough for all my pictures. I finally found your system and the We R Memory Keeper albums and pages and I FELL IN LOVE!!! It is the perfect solution to all my picture needs! Since I have twins, I have a TON of pictures but not much time! I can create simple yet elegant photo albums with your system. I love it so much! Thank you for creating such a wonderful system! I am telling all my friends/family about it and I even made a blog post about it!